Meditation is having a moment, isn't it? Sure, that moment has lasted centuries, but here in the States, the habit of sitting on our asses and doing nothing without using illegal substances beforehand is just starting to catch on. And while a smartphone may seem like a hindrance in your quest for enlightenment (it might even be the reason you need meditation), there are apps that can set you on a course toward better health, decreased stress, and an excuse to be that annoying friend who can't stop saying "namaste." The 12 apps below have their strengths and weaknesses, but whether you're on the cusp of Nirvana or can't sit through an entire Vine, there's bound to be something for you. Typical mindfulness practices usually involve sitting in silence. Good luck selling that idea to the problem-solving, solutions-focused tech crowd, which is the group buddhify targets. 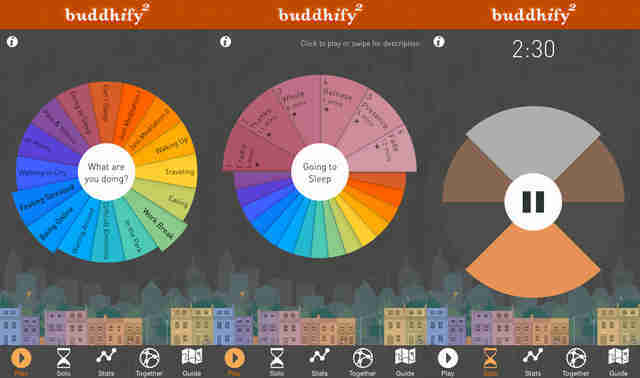 This app is all about guided meditations that help you achieve a goal, such as getting to sleep, or taking a break from work -- if you can't wrap your head around "just doing nothing," buddhify is the app for you. 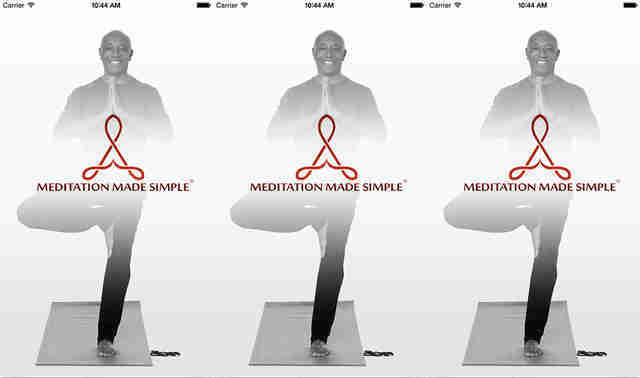 Hip-hop mogul Russell Simmons may seem like an odd spokesperson for meditation, but he’s been practicing for decades, and even coauthored a book on the subject, called Success Through Stillness: Meditation Made Simple. 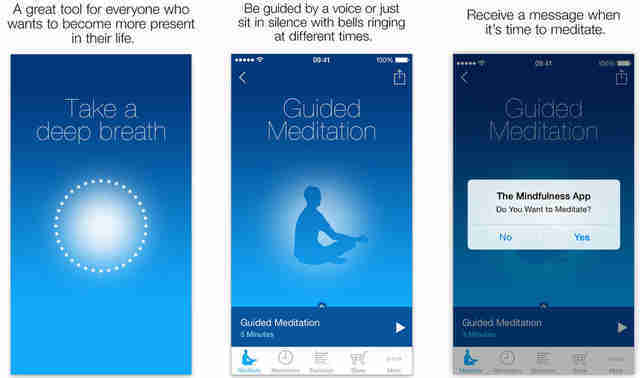 In this companion app, Simmons guides you through the process of a basic meditation. Sure, it seems like a gimmicky marketing tactic, but it’s also a worthwhile download for beginners. While The Mindfulness App offers users the opportunity to meditate in silence, you really don’t need an app for that, let alone one you have to pay for. 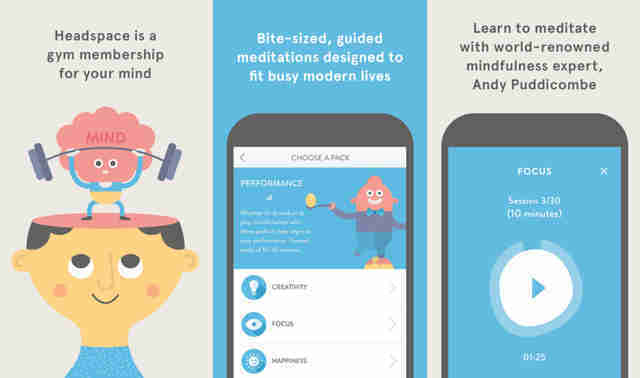 The Mindfulness App is worth your money because it links you to a store featuring guided meditations from experts on the subject, including Jon Kabat-Zinn and Sharon Salzberg. A very good option for a beginner. Meditation’s roots may be spiritual, but its growing popularity owes a lot to the fact that neuroscience backs up its brain-strengthening powers. As such, many have taken up the practice with the hopes of becoming Bradley Cooper in Limitless, with none of the psychotic side effects. 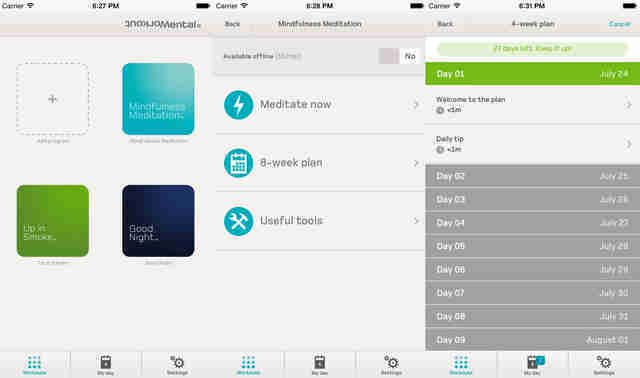 If you’re one of those types, Mental Workout -- which requires a $12.99 per year subscription to access its full catalog of programs -- is the meditation app you'll want, offering not only mindfulness exercises, but sleep aids, recordings to help you quit smoking, and many others. If you’re looking to destress, your life is probably already hectic, and taking time out to practice meditation may not fit into your schedule. This app will give you brief, customizable stress-relieving guided meditations to help you step back from your day-to-day concerns for a few minutes. 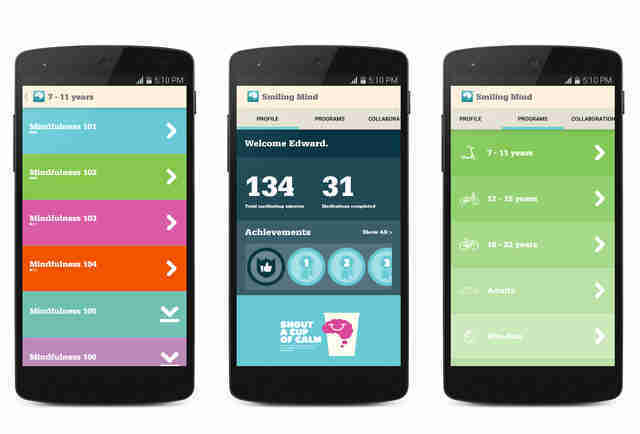 The main draw of Smiling Mind is the way in which the app is designed to cater to users of all ages. Getting a little kid to sit still and focus on their breathing is about as easy as... nope, can’t come up with an analogy here. There's no comparable challenge. Smiling Mind tries, though. 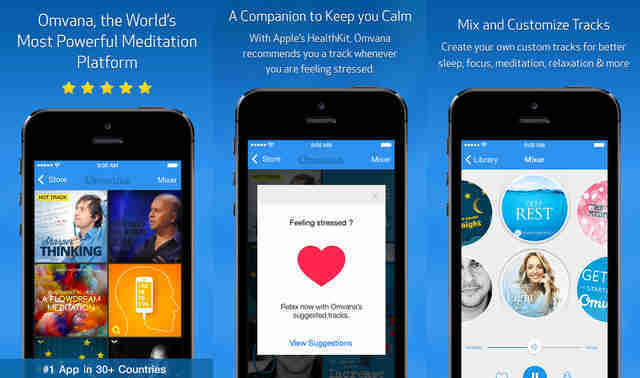 Its goal is to give users “lifelong tools” to get the most out of meditation. It might just deliver, too; its developers are psychologists trained in youth and adolescent therapy, and the app offers programs for children as young as 7 years old. 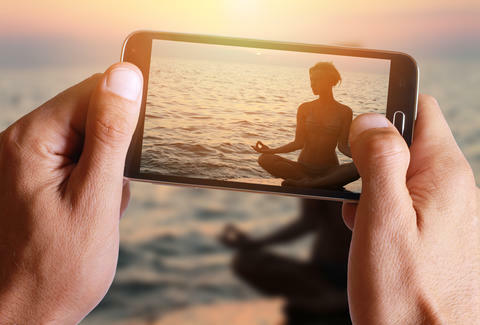 While mindfulness may be all about accepting what is, easing a tech-addicted generation into that idea may require letting users enjoy the kind of personalized experience we’ve come to expect from our mobile devices. 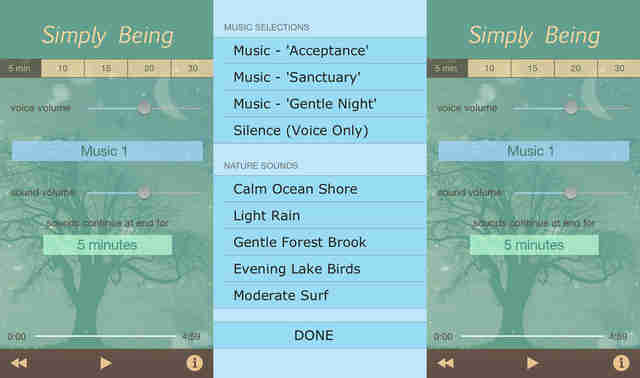 To that end, Simply Being provides users with the option of determining how long they wish to meditate, what kind of music they prefer, or if they want nature sounds, music without a guided meditation, simple silence… you get the idea. On its own, Omvana doesn’t offer much, other than some sample recordings. But this free download provides access to an iTunes-esque store stocked with enough audio tracks to put you well on your way to digital enlightenment. Many of these recordings are geared more toward hypnosis than meditation, so if you’re a mindfulness purist, Omvana might not be for you. However, if you just want to relax, this app will give you plenty of options to achieve that ever-elusive goal. If you’re no newbie to meditation, but want something a little less jarring than a ringtone to time your sessions, Meditation Timer Pro will suit your needs perfectly. 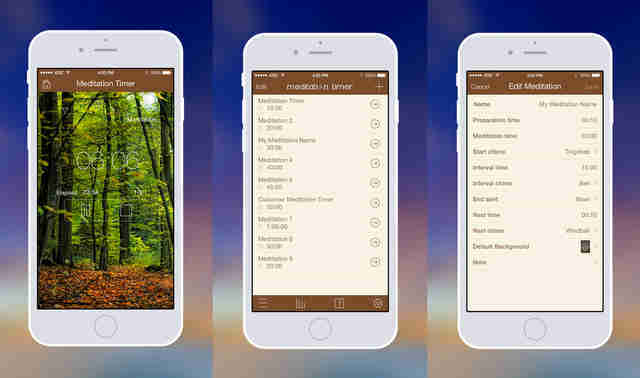 Along with setting tones to let you know when your session is complete, you can also adjust alerts for the various intervals of your meditation, if your practice involves gradually entering deeper states of relaxation. Not a beginner’s tool, but a helpful one for anyone who wants to get the most out of his current routine. Of course Oprah and Deepak Chopra offer a “meditation experience,” complete with online downloads to help you go from spiritual lightweight to mildly enlightened meditator in as little as three weeks. Hey, people have found the program to be helpful. This companion app allows users to access their content on-the-go, but keep in mind, that's pre-purchased content. This isn't as free as it may look in the app store. 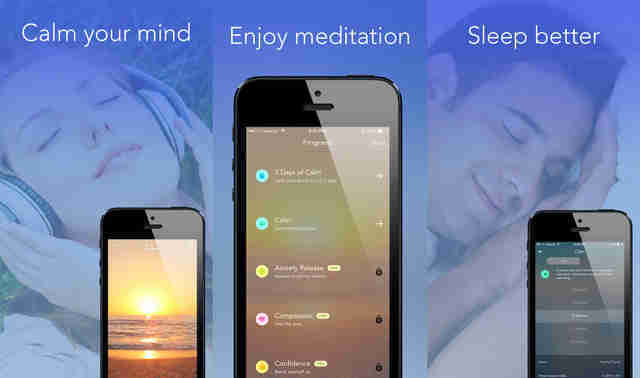 As the name suggests, the primary goal of Calm is to help users chill out. 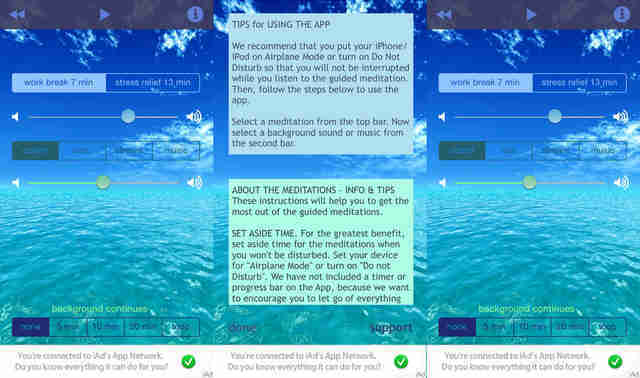 Although there are many benefits to meditation, this app is for those who are, first and foremost, interested in a little relaxation. 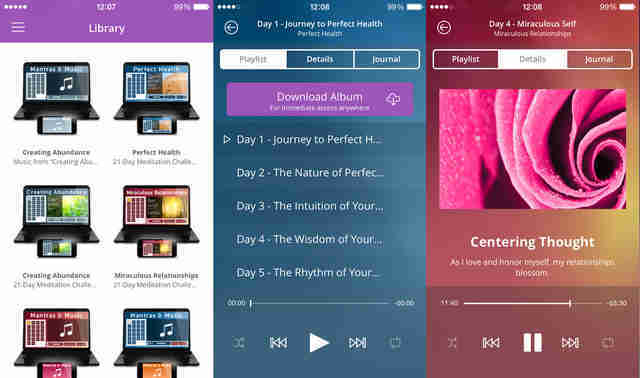 The free version delivers some impressive features to introduce you to meditation -- a week-long introductory period, seven guided meditation sessions, 10 audio nature "scenes" for ultimate relaxation, and 16 music tracks -- while the subscription unlocks the door for premium relaxation content. Headspace calls itself “a gym membership for the mind,” focusing on the scientifically validated benefits of meditation in order to lure skeptics who might write mindfulness off as spiritual stupidity. The free download offers enough features to get you interested, but to unlock the full potential of the app, you’ve gotta shell out cash for one of the subscription options, which will grant you access to hundreds of exercises geared towards various goals and lifestyles. That said, if you’re serious about getting in mental shape, it could be money well spent; Headspace’s creator, ordained monk Andy Puddicombe, spent a decade living among master meditators, so he knows his stuff. Check out one of his TED Talks if you're not convinced. And Emma Watson deemed Headspace “kind of genius,” which should be all that anyone needs to jump on the bandwagon. Joe Oliveto is a writer for Thrillist. Getting into meditation was the smartest thing he ever did, forgetting to do it every day feels like the dumbest. Follow him on Twitter.